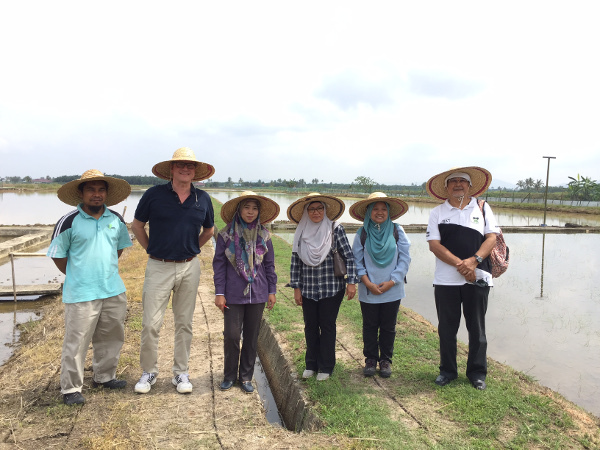 Field trial visit to the Center of Excellence for Rice in Malaysia, left to right: Shahrizal Abdul, Rob van Daalen, Raudhah Talib, Dr. Suzana Yusup, Noor Hafizah Ramli and Abu Bakar Ahmad. Editor’s note: This month, we are exploring the theme “from science to society” – how research and innovation are making a difference in all aspects of life. This is certainly the case with sustainability science. 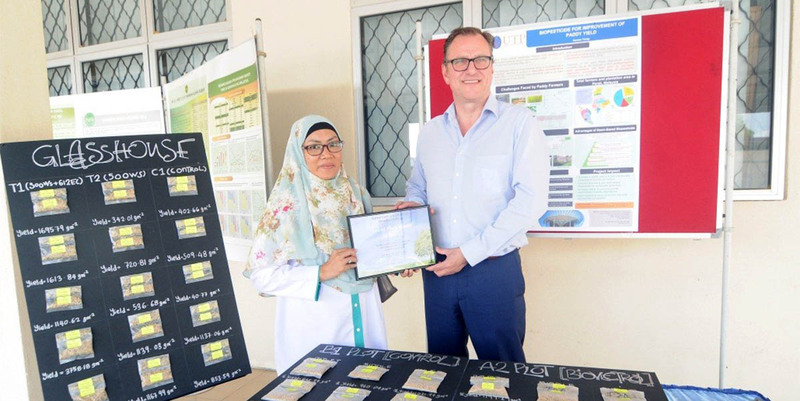 Here, Rob van Daalen, Senior Publisher for Elsevier’s Chemistry portfolio, visits Malaysia to learn more about a winning research project in the Elsevier Foundation Green and Sustainable Chemistry Challenge. Parit Buntar, Perak, Malaysia — Rice is an important crop in Malaysia, yet the indiscriminate use of pesticides has caused health problems for many farmers. Meanwhile, almost half of them live below the poverty level, causing many to leave the field for other kinds of work. These challenges inspired a group of researchers in Malaysia to find a safer, more sustainable means of pest control that would also boost crop yield, raising farmers’ incomes and encouraging them to stay in this much-needed profession. At the same time they were doing their field trials, we initiated the Elsevier Foundation Green and Sustainable Chemistry Challenge, inviting researchers around the world to submit innovative ideas with practical applicability. Of the nearly 500 proposals, one was from these researchers in Malaysia. Their proposal — “Biopesticides for improved paddy yield” — went on to become a winner. 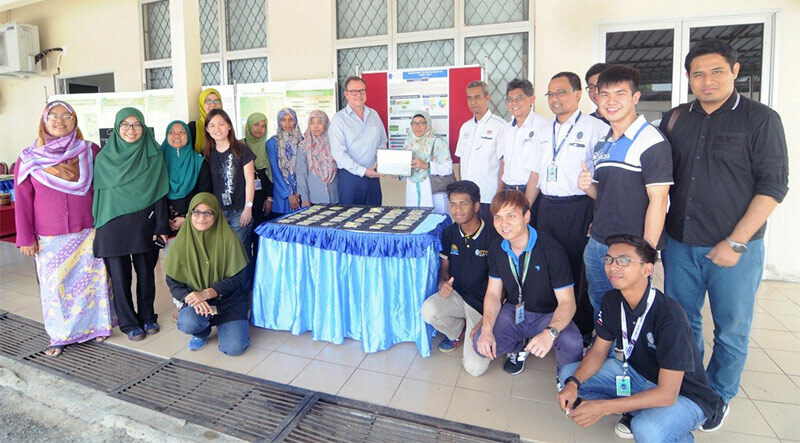 The project, a collaborative effort between the university and the Malaysian Agriculture Department as well as Bio-X Techno, showed how biopesticides can be used to increase the yield of rice crops without the dangerous health effects associated with chemical pesticides. "It gave internal recognition and the opportunity to enhance our research to support the global (UN) SDGs. It captured public attention, particularly the farmers, on the importance of the application of green and sustainable methods for improving paddy yield. The research support received through Elsevier Foundation also enables us to accelerate our research in a trans-disciplinary manner, collaborating with people from industry, farmers, governmental bodies and social sciences." Lead researcher Dr. Suzana Yusup, Associate Professor in the Chemical Engineering Department of the Universiti Teknologi PETRONAS, Malaysia, shows the results of her team’s field trials to Rob van Daalen, Senior Publisher for Elsevier’s Chemistry journals, who initiated the Green and Sustainable Chemistry Challenge in collaboration with Prof. Klaus Kümmerer of Leuphana University. Pesticides are considered to be an easy, fast and cheap solution for controlling insect pests in paddy farms. Their usage has significantly increased the quantity and quality of food. However, the application of pesticides has been shown to have adverse effects for human health and the environment. According to Dr. Yusup, the health impact on society in general – and vulnerable population like children in particular – is one of the consequences of indiscriminate use of chemical pesticides (Bhardwaj and Sharma, 2013). These authors describe that in India, effects of pesticide exposure can include acute poisoning, cancer, neurological effects and reproductive and developmental harm among human beings. Bhardwaj and Sharma also stated that prolonged pesticide exposure can include liver malfunction, immune malfunction and neurologic impairment. Meanwhile, researchers at the National University of Malaysia uncovered an excess mortality from cardiovascular and respiratory diseases, possibly related to the psychosocial consequences of chemical contamination (Fuad et al, 2012). Another issue is the correct application of fertilizers and pesticides. A 2016 study in Malaysia by Zainalabidin Mohamed et al, showed that the majority of the farmers (80 percent) practiced quite unsustainable paddy farming. Farmers are using excessive fertilizer, pesticide and herbicide, which raises concern for food safety, environmental protection and producers’ health issues. The UTP research project on biopesticides will suggest a solution towards more sustainable farming. On the first day of my visit, Dr. Yusup and her team presented their project’s approach and the results until now. They had tested the effectiveness of a biopesticide created from extracts of a fast-growing tree called Neem (Azadirachta indica). They studied it for three seasons on paddy planting areas and in a glasshouse at the Paddy Centre of Excellence in the Titi Serong Agriculture Department. 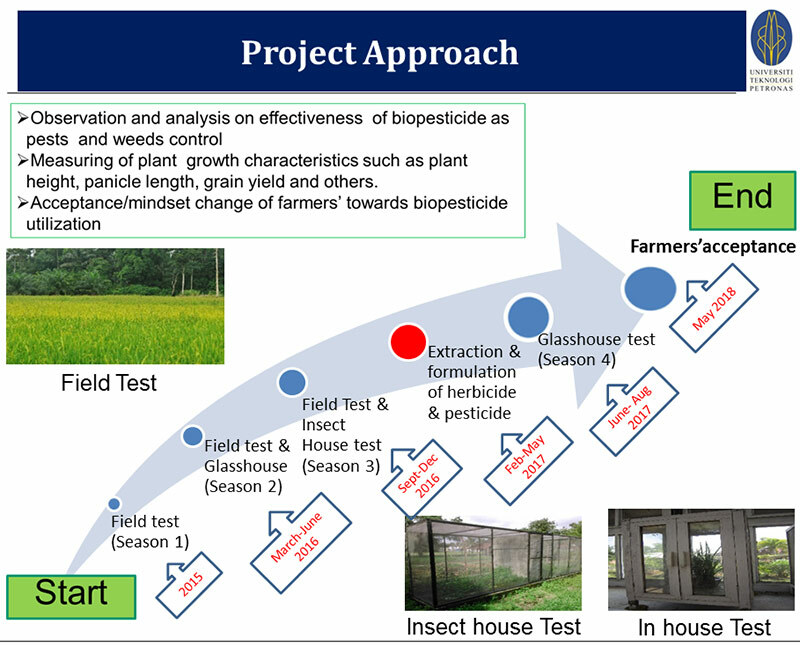 In comparing this biopesticide to a regular chemical pesticide, they found that the yield increased despite unpredictable weather conditions. Dr. Yusup and her team gave an overview of the project and the results. The following day, we visited the Center of Excellence for Rice (in the top photo), where we met with representatives from the Agricultural Department: Raudhah Talib (responsible for the field trial), Mardyahwati Abd Rahim (responsible for the glasshouse experiment) and Sulaiman Mokhtar of Bio-X Techno. After they updated on their involvement in the project, we headed out to the rice fields. Then we visited a conference of the Farmers Association, where lectures were given by Dr. Yusup and representatives from the Malaysian Agriculture department. Increased paddy yield is important for the farmers as almost half of them have an income below the Malaysian poverty level of €165 per month. Rice farmers will survive – they eat and live properly – but the income for farmers is still lower than in other sectors. As a result, many rice farmers give up and sell their land, and the younger generation is not really interested in agriculture. Dr. Suzana Yusup addresses farmers and villagers in an engagement session at Pertubuhan Peladang Kawasan Bota. Dr. Suzana Yusup and Rob van Daalen (center) with researchers from Universiti Teknologi PETRONAS after an engagement session with farmers and villagers at Pertubuhan Peladang Kawasan Bota. The results of the project have been well received, and the Malaysian Agriculture Department will support further rollout. At the end of the conference, I was asked to present a gift to the widow of one of the farmers. He had participated in the biopesticides project but died of cancer before the conference, possibly because of the effect of long-term exposure to pesticides. No poverty (SDG 1): Currently, 45 percent of the farmers in Malaysia have an income below the poverty level; the increased yield can improve this. Good health and well-being (SDG 3): There are currently many health issues among farmers, the biopesticide will help to improve this situation. Responsible consumption and production (SDG 12): Eliminating the use of pesticides will ensure the responsible production of rice and improve food security. Life on land (SDG 15): the environmental situation will improve significantly by the use of biopesticides. As a global provider of information and analytics in the world of science and health, we are proud of our unique contributions to sustainable development – from our publishing portfolios and analytics capabilities to building research capacity in developing countries and advancing diversity in science. We believe that we can have the most significant impact when we apply our expertise and support in partnership with our global research and health communities. This is what we did with the Green and Sustainable Chemistry Challenge, and it is very rewarding to see that the modest support by Elsevier’s chemistry portfolio and the Elsevier Foundation could have such a positive impact on the health situation, the environment and society of rice farmers.